Integration of a structure with Vorticella (Upper, A, B). Repetitive movement of a structure due to the force of Vorticella and flow (Lower, C, D). Credit: Toyohashi University Of Technology. A research team at the Department of Mechanical Engineering at Toyohashi University of Technology has developed a method to construct a biohybrid system that incorporates Vorticella microorganisms. The method allows movable structures to be formed in a microchannel and combined with Vorticella. In addition, the biohybrid system demonstrates the conversion of motion from linear motion to rotation. The results of their research was published in the IEEE/ASME Journal of Microelectromechanical Systems on April 11th, 2019. Complex control systems are required for the operation of smart microsystems, and their sizes should be reduced. Cells are expected to be applicable as alternatives to these complex control systems. Because a cell integrates many functions in its body and responds to its surrounding environment, cells are intelligent and can be used in smart micromechanical systems. In particular, Vorticella convallaria has a stalk (approximately 100 μm in length) that contracts and relaxes, and it works as an autonomous linear actuator. The combination of stalks and movable structures will form an autonomous microsystem. However, the construction of biohybrid systems in a microchannel is difficult, as it is necessary to establish a cell patterning method and a biocompatible assembly process for the structure and cell. The research group has developed a method to construct a biohybrid system that incorporates Vorticella. "Harnessing microorganisms requires that a batch assembly method be applied to the movable components in a microchannel. It is necessary to pattern a water-soluble sacrificial layer and confine the movable components in a microchannel," says Moeto Nagai, a lecturer at Toyohashi University of Technology and the leader of the research team. Vorticella cells were placed around blocks in the channel by applying magnetic force. These processes were applied to demonstrate how Vorticella converts the motion of a movable component. A channel is closed at low calcium-ion concentration (Left). Vorticella opens the channel at high calcium-ion concentration (Right). Credit: TOYOHASHI UNIVERSITY OF TECHNOLOGY. 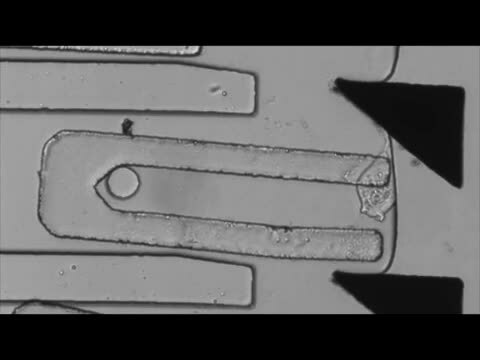 "The concept of harnessing a component to a microorganism seems simple, but it is difficult for even a microfabrication expert to make harnesses that can follow the motions of microorganisms. Hazardous chemicals should be avoided, and a multidisciplinary approach should be taken," says Nagai. His group is familiar with microfabrication and has conducted considerable research in the field of microbiology. They found a biocompatible approach for making and releasing harnesses in a microchannel. A free-floating component is harnessed to Vorticella and the component is autonomously rotated and returned by means of a biohybrid approach. Credit: Toyohashi University Of Technology. After permeabilized treatment, Vorticella stalks respond to changes in calcium ion concentration, and they can operate as calcium ion-responsive valves. The research team believes that calcium ion-sensitive motors of Vorticella will facilitate the realization of autonomous fluidic valves, regulators, and mixers, as well as wearable smart microsystems, such as an automated insulin infusion pump for diabetes. More information: Moeto Nagai, Kohei Tanizaki, Takayuki Shibata (2019). Batch Assembly of SU-8 Movable Components in Channel Under Mild Conditions for Dynamic Microsystems: Application to Biohybrid Systems, IEEE/ASME Journal of Microelectromechanical Systems, 10.1109/JMEMS.2019.2907285.